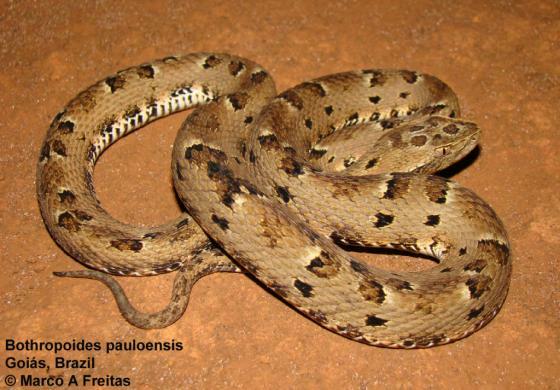 Can you confirm these amateur observations of Bothrops pauloensis? 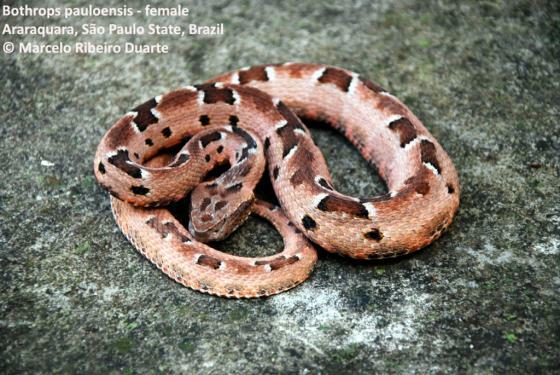 Type locality: Leme: São Paulo: Brazil. Diagnosis Diagnosis: Postocular stripe well marked, which frequently expands around the labial fissure, developing a melanism on the sides of head. All the supralabials with uniform pigmentation, without conspicuous spots. Oblique occipital blotches rarely surpass quadratemandibular articulation, consequently postcephalic stripes are absent. Borders of the dorsolateral blotches with variable contour: diffuse or well marked. Blotches between two consecutive dorsolateral blotches usually absent. Keels with the same coloration of the dorsal scales. Ground coloration extremely varied, but the cream tone with the black dorsolateral blotches are more common. Dorsolateral blotches of the trunk from 11 to 25 (modes 15 and 17) with variable formats and relatively distant from each other. Lacerda, J.B. 1884. 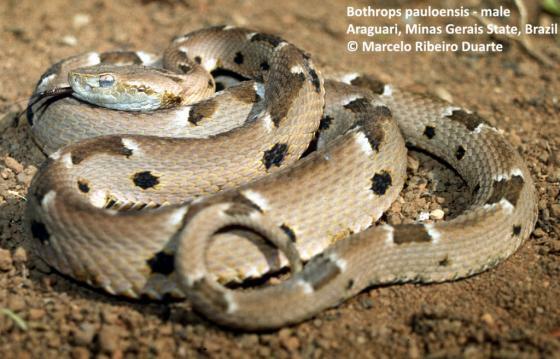 Leçons sur le venin des serpents du Brésil et sur la méthode de traitement des morsures venimeuses par le permanganate de potasse. Rio de Janeiro, Lombaerts & C., 194 pp.